~ Martial (Roman Poet) from Epigrams, 86 A.D. 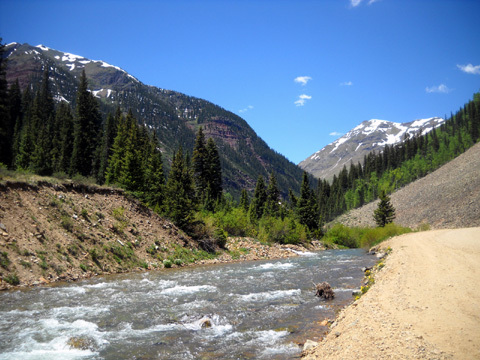 While we were at Dr. Scott's orthopedic office in Durango yesterday we talked with Corinne, his nurse, about the current hiking conditions in the San Juan Mountains. Because of all the lingering snow she was able to climb up only about halfway last weekend to the Ice Lake Basin, one of my favorite mountain treks near Silverton. 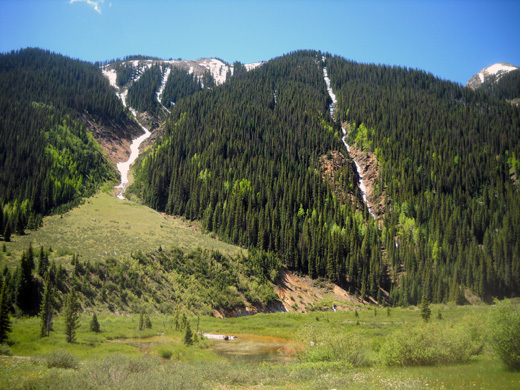 The upper basin is between 12,000-13,000 feet in elevation. That means I may also have problems getting up all the way to Clear Lake (elev. 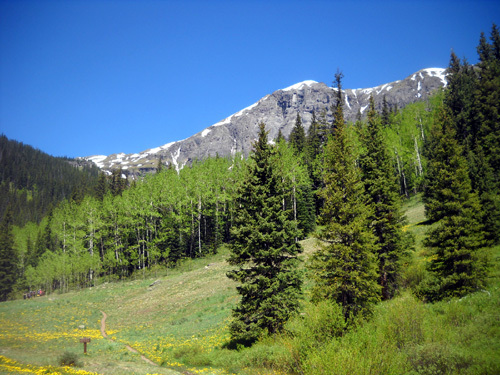 about 12,000 feet), which is just down the road; last year we couldn't hike up there until July. 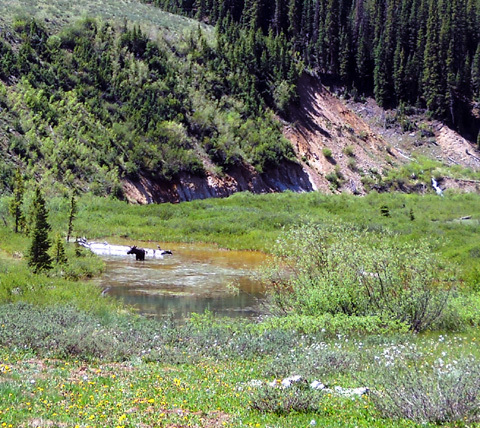 The ponds and willows between South Mineral Creek and the road are prime moose habitat. 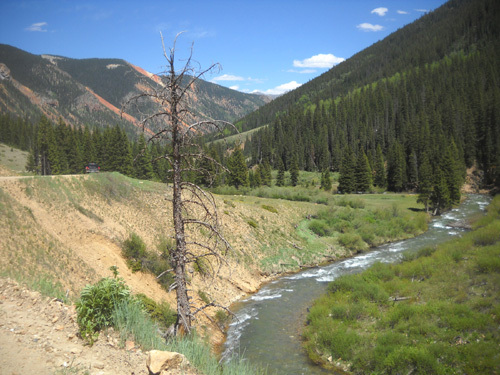 Corinne's sister is camped somewhere along South Mineral Creek Road this week, in the same general area where we are. 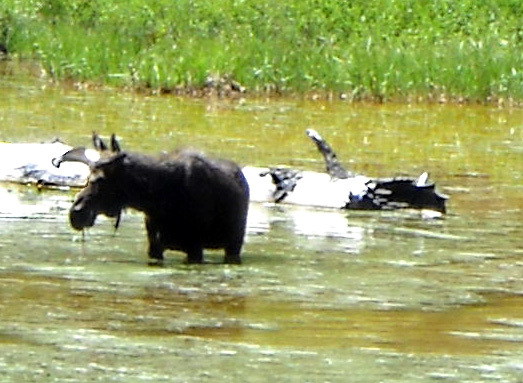 She reported seeing a moose in the creek near her RV a couple days ago. I love watching moose. I decided I'd have to hunt for it today. We've seen moose along "our" road only once or twice before. We woke to sunshine and 45 F. temperatures this morning. 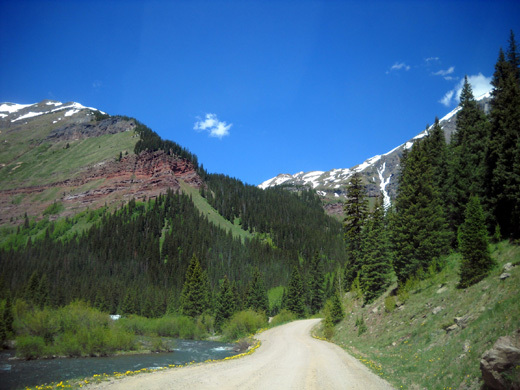 After Jim ran some errands in town I hopped in the truck with Cody so I could explore the road down to the Ice Lake trailhead and hike up the trail for about a mile. My moose radar was set to "high." 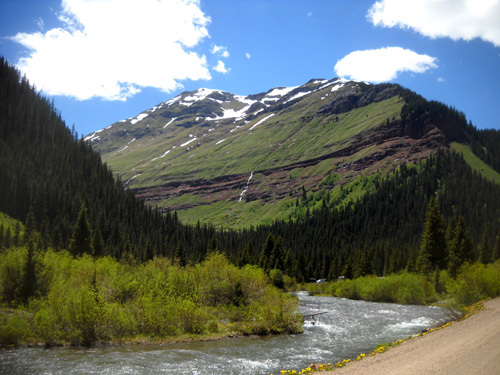 The drive was gorgeous with all the waterfalls, snow up high, and rushing creeks. 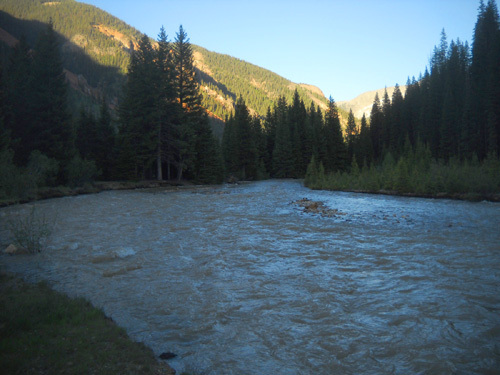 The middle fork of Mineral Creek, which intersects with the south fork just west of our CG, is very full, too. It was clear when I drove over it this morning in the truck, and mid-afternoon when I was out on my bike (photo above), but by 6:30 PM it was very muddy when Jim and I took another ride down the road. A little past the bridge this morning I saw a vehicle parked to the side of the road. 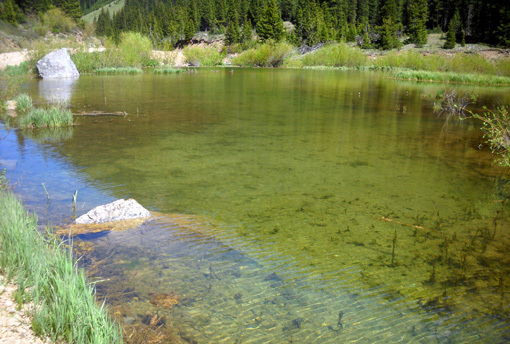 A young couple was out of the car, looking over the meadows and little ponds toward S. Mineral Creek. They had spotted a moose, probably the one Corinne told us about yesterday. Cool! 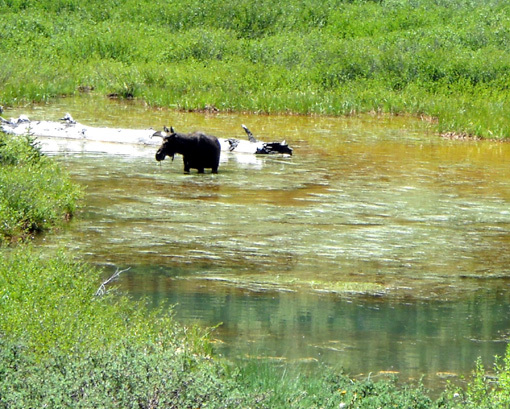 The moose was standing almost tummy-deep in a pond in the classic moose pose, dipping its head into the water and coming up with dripping strands of vegetation to eat. The best close-up I can get with my inexpensive compact Nikon Coolpix L20 digital camera . . . I got a few decent photos out of about ten I took but they look best blown up much larger than I can show them here. Good thing, because in five more passes of the area today I didn�t see any moose or other large critters again -- after my hike, during my bike ride out and back, or on Jim's and my after-dinner foray out and back along the road. Rats. I was hoping Jim would get to see the moose foraging for dinner. 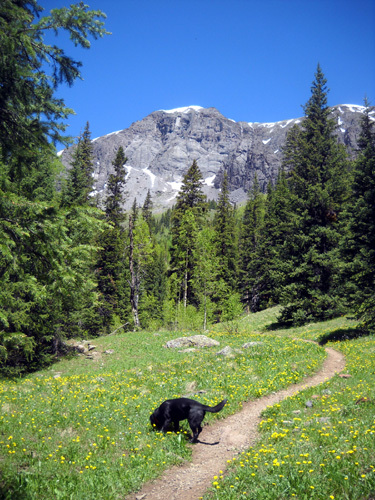 Cody and I began our hike on the Ice Lake Trail about 11 AM. There is a parking area across from the South Mineral CG about four miles back South Mineral Creek Rd. AKA FSR 585. 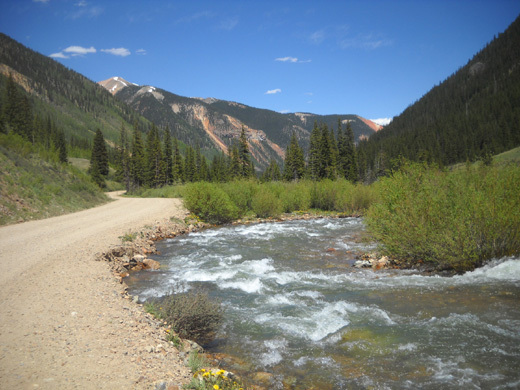 This was an exploratory hike to see how challenging the Clear Creek crossing will be when I attempt a longer trek up to the Ice Lake Basin. 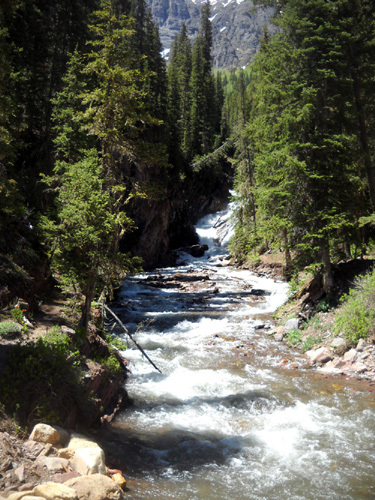 I just went up from the trailhead at 9,847 feet for about � mile to the falls and first creek crossing. Look at all the dandelions! There are some other spring flowers, too. I didn�t have the GPS on so I don�t know how high we got but it was probably at least a 500-foot gain. 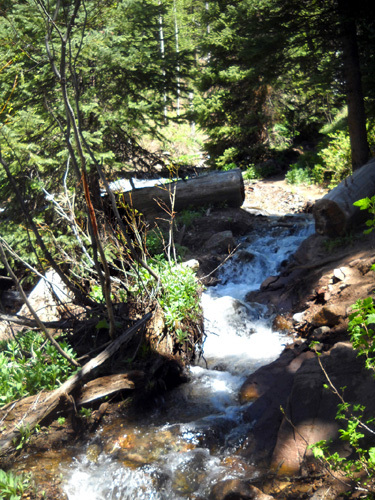 This stream = the trail. 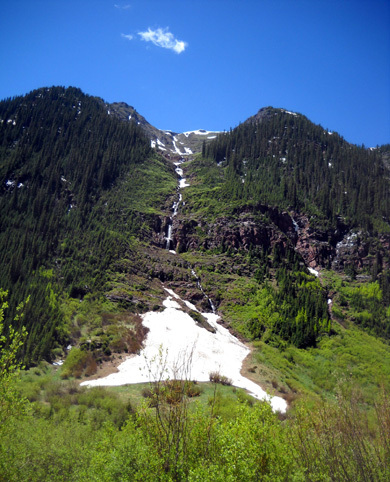 The falls above it were also the biggest I�ve seen there and some little streams coming down the mountain were bigger. 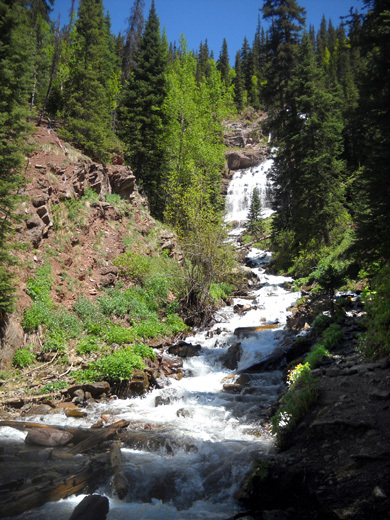 This is one of many falls and cascades as the creek tumbles 3,000 feet from Clear Lake to the south fork of Mineral Creek. It's running fast and the rocks are slick, so I'll need my trekking pole(s). There are some logs across the creek a little further downstream but I'm too uncoordinated to cross on those. Except for overflowing streams the trail was very dry. 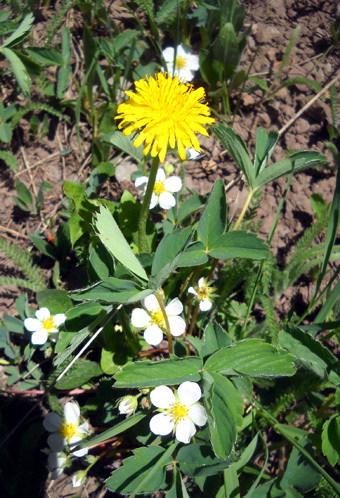 Lots of dandelions and other flowers are blooming along the trail in the meadows, and some little red columbines in the shade. This falls is downstream from the one shown earlier. 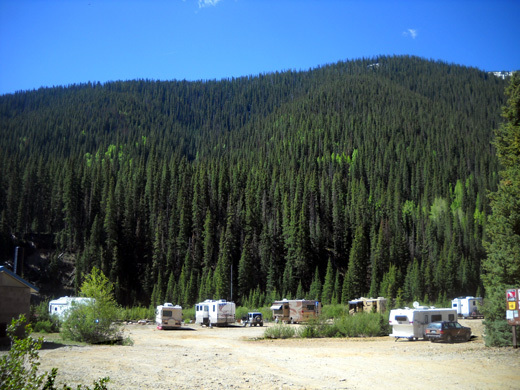 On the way back I cruised through the for-fee (South Mineral) Forest Service campground and the free camping area next to the middle fork of Mineral Creek, for a total of 8 � + miles. 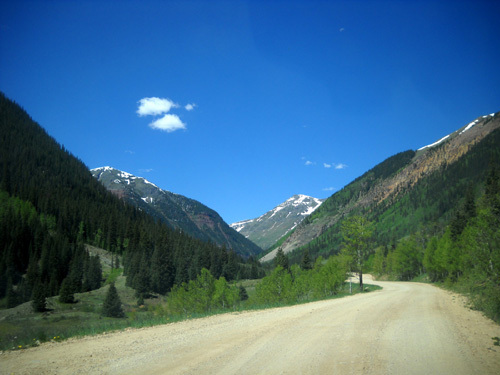 South Mineral Creek Road is fairly smooth to drive but it�s bumpy on the bike. 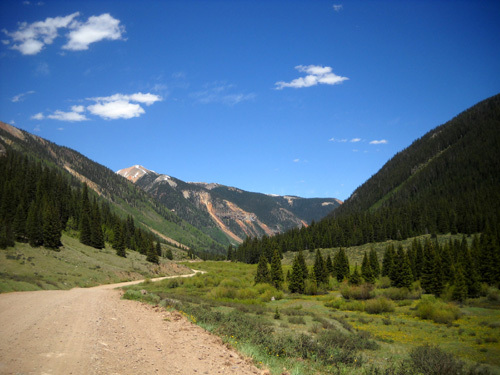 I took my time going out because it�s a net elevation gain (9,505-9,916 feet, per the Garmin Forerunner), I had a definite headwind, and the dust from vehicles was blowing into my face. It was much easier coming back to the CG but I had to use the brakes a lot so I didn�t go too fast. I don�t want to wreck again! X marks the approximate spot. 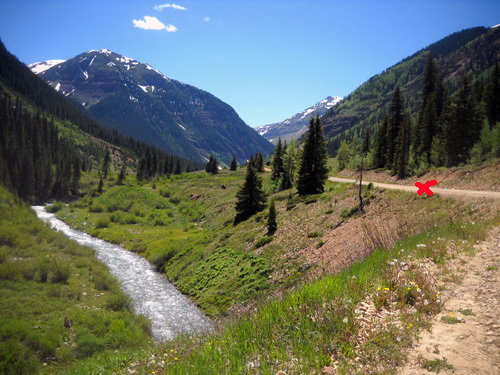 Oddly, it�s not weird to go by the place where I could have lost my life two years ago -- I had head trauma and serious road rash -- but I know the TriCross tires have less rugged tread than the bike I was riding that day (Jim�s old Trek mountain bike). It would be real easy to slide out on the loose dirt and gravel on the TriCross. That's probably what caused my wreck but I doubt I'll ever know; I haven't recovered any memory of what happened. I guess that's why I'm not traumatized when I return to the scene of the accident. There's a disconnect. Cognitively I understand that I got injured there because Jim, my rescuers, and the EMTs said I did, but I don't have any psychological associations with that spot because I have no first-hand knowledge of it. 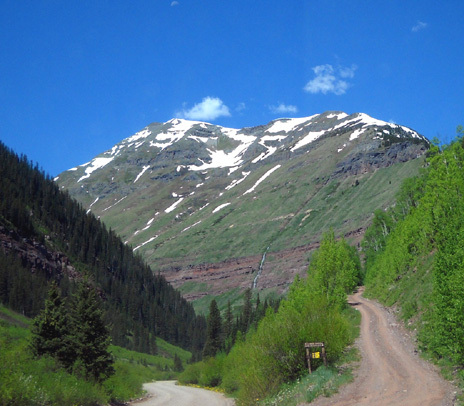 in the Hardrock race, and end of the gulch; the road on the right goes up to Clear Lake. There wasn�t too much traffic on the road this afternoon, even though I took my sweet time and was out there longer than I will be the next time (took more pictures today). I counted nine vehicles outbound and two on the return. Some folks go too fast on the road, even with RVs, but the ones I encountered on the bike were well-behaved today. I was surprised there aren�t more folks in the second no-fee campground to the left that is about two miles beyond our site. 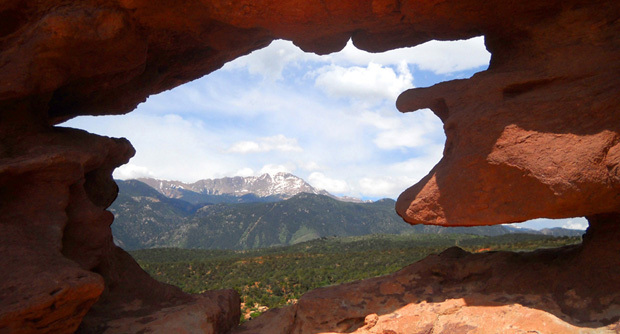 We camped there in 2006-7. In the picture above you can see a couple of tiny white specks above the creek in the distance; those are RVs in that campground. In the evening they get muddy when silt washes down with the day's snowmelt. After supper when Jim and I drove up the road the sun was in our eyes and it was harder to see. The sun goes down behind the mountains pretty early here (by 7 PM) and comes up �late� � even though we�re just past the �longest day.� It�s very different than our other camping spots so far this summer, where we weren�t in a canyon. We saw a big fat porcupine run across the road in the general vicinity where the moose was munching this morning. We don't remember ever seeing one in the wild with its quills open like that. I was unable to get a good picture as it raced across the road. By then both creeks near us were definitely higher with all the snow that melted today. 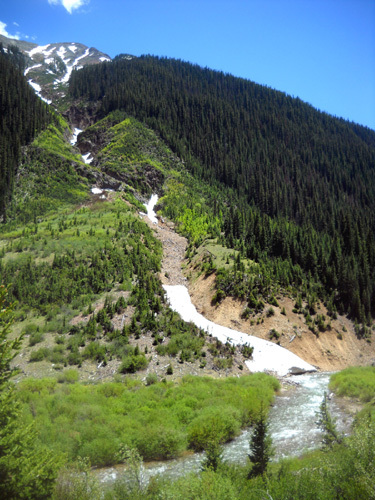 The south fork was still fairly clear up to its convergence with the middle fork. After the muddy middle fork dumped into the south fork the whole creek was very muddy a little farther downstream as it flowed past our campground. Our campground is filling up each day with RVs, too. This time of year there are more people coming into our campground than leaving, although it's always in a state of flux. Many of these folks will remain through the holiday weekend. Last year some folks came in the weekend before the Fourth, then left their RVs sitting there empty the next week to save their spots. That�s not kosher. It happened to the spot we�re in. I don�t think that 5th-wheel has arrived yet; those folks may be disappointed to see "their" spot taken this time. 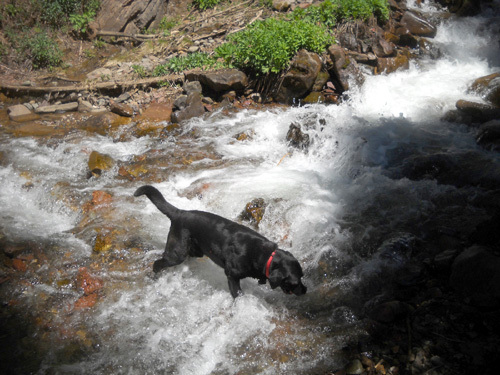 I took Cody over to the creek in our campground when we got back; it was even higher than last night. I think I might be a little worried if I was camped right there (like Roy and Laura) but they don�t seem concerned. I talked with the host at the for-fee forest service campground farther back the road when I was riding my bike this afternoon. He said a few days ago he had to move a couple of the campers to different sites because the creek was flowing into their sites. The creek is smaller there than it is downstream at our campground. It was flowing higher through our campground last week, too. I've often talked in this journal about the importance of being optimistic, flexible, and able to adapt to changing circumstances. People who can do that readily live happier lives. I've been very concerned about Jim's ability to deal with the possible loss of his favorite sport, running. Today he showed signs of already adapting to that very real possibility -- in less than 24 hours since his consultation with Dr. Scott! 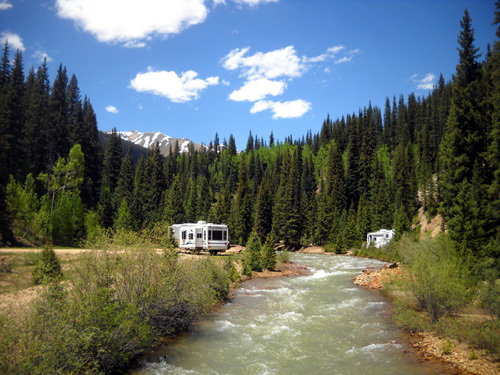 The only RV, travel, or fitness blog I currently read on a regular basis is Dale�s RVeCafe, which has separate journals for his and his wife Gwen�s travel entries, Cameo 5th-wheel modifications and repairs, etc. Dale and Gwen have been full-time RVers for several years. Although we've never met, I feel like I know them from reading their journal (I get that comment from readers of our journal, too). I discovered this morning that Dale also has a cycling blog on the site. Jim and I have both begun reading it. Dale rides more on his road bike than his mountain bike but his entries give us ideas of routes and races. I was happy when Jim began talking more today about possible rides/races he could do! Both Dr. Johnson and Dr. Scott have recommended more riding than running because of his (and my) knees. If we could do more bike training and even races (I�m less interested in racing than Jim is) it would give Jim the opportunity to set training and racing goals similar to foot races. This is a very positive step toward adapting to our changing circumstances as we age . . .
Another view of the cliff where I had my bike wreck in 2009. I landed right at the edge but didn't go over. Depending on what Jim's MRI shows tomorrow, we might be in the market soon for a new bike for him. His old Trek mountain bike doesn't encourage long rides and he isn't fond of my Specialized TriCross cyclocross bike. Not only is it configured for me, it was also the bike he was riding when he messed his knee up last fall. He needs his own spiffy bike that fits him and works better than his old one. Then he'll be more likely to enjoy it and do more riding. Staying fit becomes more challenging as we age.